Tropical North Queensland is one of the most visited regions in Australia, and is the perfect destination for a road trip. In just a few hours, you can experience the beautiful coastline, tropical rainforests and country villages. What more if you make it a 9-day road trip? VroomVroomVroom shares this self-drive itinerary from Cairns to Daintree so you can make most of your driving adventure. Cairns is the perfect introduction to your Tropical North Queensland adventure. Although you are in such a remote corner of Australia, Cairns still feels like an exciting city. 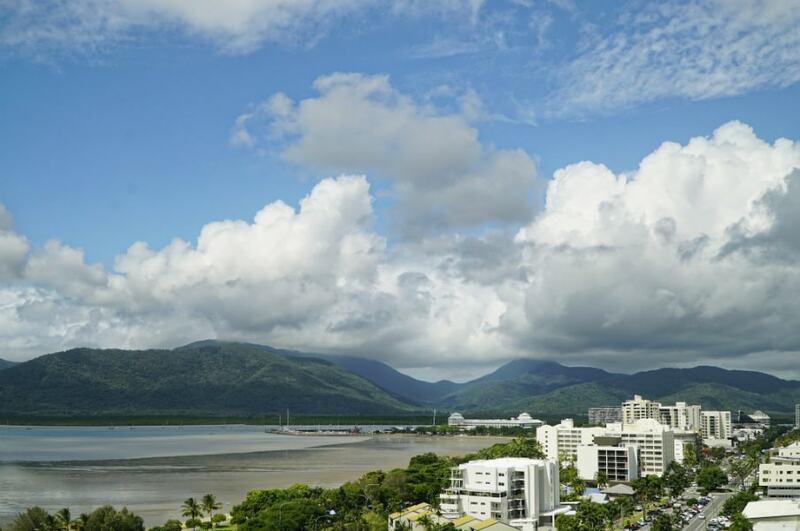 Wander along the Cairns Esplanade to enjoy views of the harbour, and even take a late dip in the Lagoon. The temperature in the Far North means it is always a good time for a swim! Take the rental car for a drive and visit Tjapukai, a cultural centre dedicated to showcasing the history of the local Aboriginal people. This is a great way to learn more about Aboriginal culture in Far North Queensland, and get a window into life in the tropics, dating back thousands of years. If you're up late, walk through the Cairns Night Markets to find your souvenir. The Botanic Gardens, located in the leafy suburb of Edge Hill, are the perfect place to go for a hike. There are various trails there for all levels of hiking. Try the Blue Arrow Walk if you are after a challenge. The trail is over 5km long and winds its way to the top peak, providing great views over Northern Cairns. Palm Cove is just north of central Cairns, and you'll have plenty of other beaches to stop and see on the journey north. For a quieter experience, try Yorkey's Knob. Trinity Beach is popular for young travellers, and if you want to mingle with the locals, Clifton Beach is the way to go. Palm Cove is the height of luxury tourism in the Far North. With fancy resorts lining the waterfront along with boutique cafes and fine-dining restaurants, this is the destination to spoil yourself. Hire a kayak and head out toward Double Island, or just wander along the pier for some great views of the palm-tree lined beach. Palm Cove is a popular destination - so be prepared to fight the crowds! As you follow the scenic Captain Cook Highway toward the popular resort town of Port Douglas, you'll come across many interesting attractions. For anyone keen on getting up close to the wildlife of Tropical North Queensland, stop in at Hartleys Crocodile Adventures. You'll be able to see these impressive creatures from a boat tour around the lagoon, as well as see other native Australian wildlife like cassowaries, kangaroos and snakes. 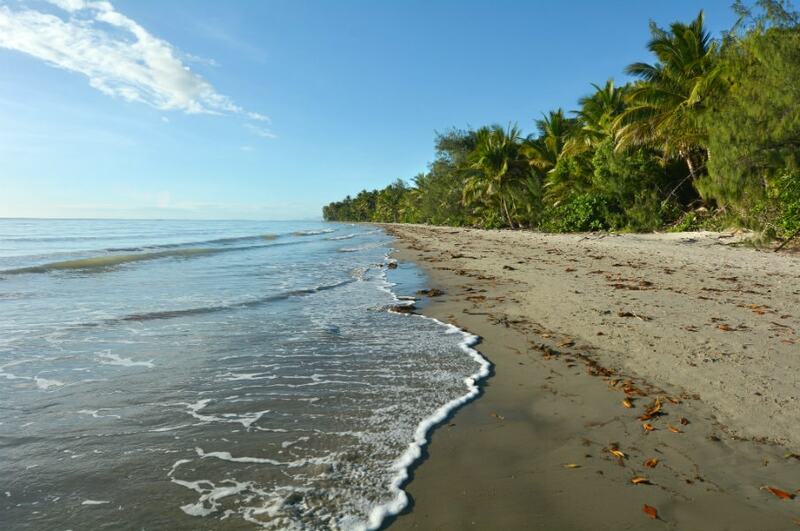 Continue along the coast until you reach Port Douglas. Explore the main street and visit some of the unique shops. You'll find some great Asian cuisine in town, as well as some refreshing snacks and drinks to take the edge off the heat. 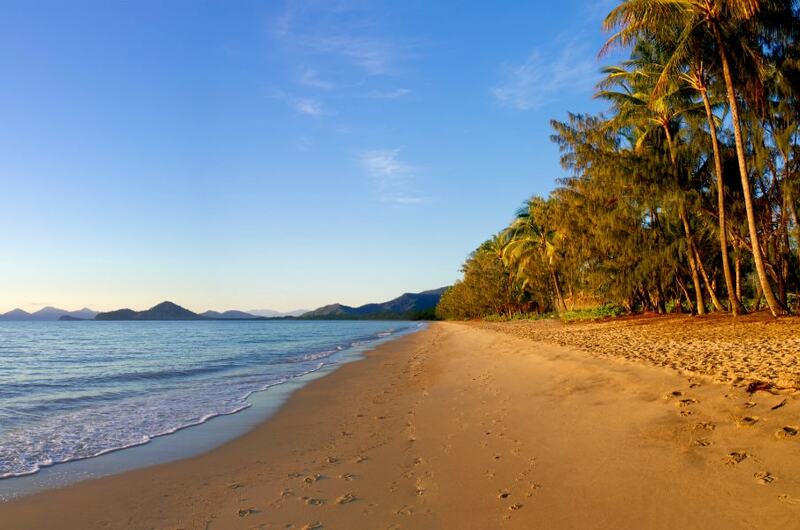 Visit Four Mile Beach, and catch the sunset over one of Queensland's most beautiful beaches. Just outside Port Douglas, be sure to stop and explore the popular Mossman Gorge. 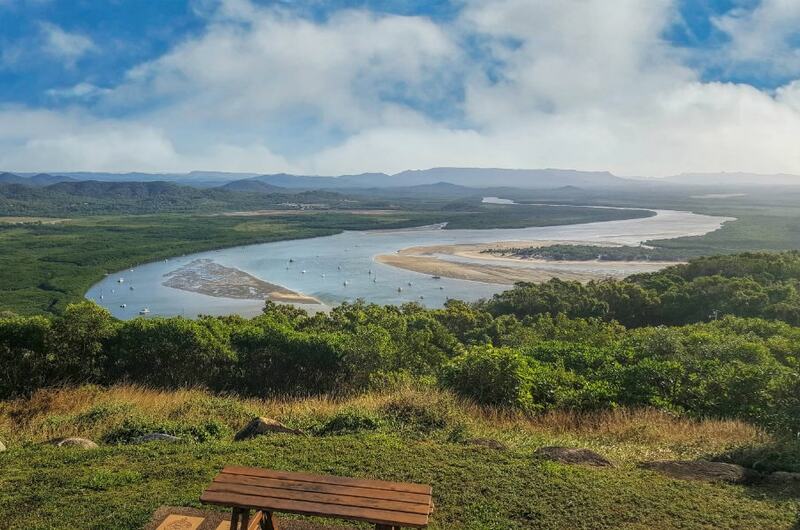 It is a must-see stop on the North Queensland tourist trail, and provides some great river views. 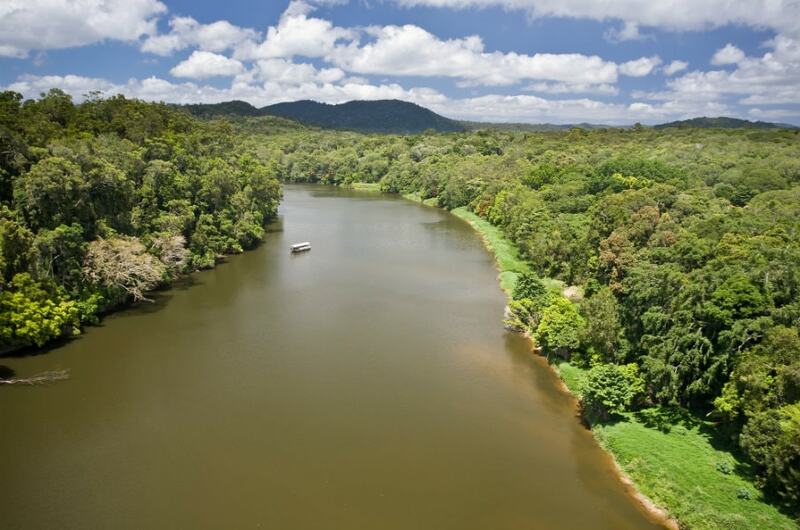 Soon after, you'll come to the mighty Daintree River. To continue into the rainforest, you will need to cross the river on the vehicle ferry. For the perfect introduction to the rainforest, visit the Daintree Discovery Centre and follow the boardwalk through the forest. With interactive displays, you'll be able to learn more about one of the world's oldest rainforests. If you keep your eyes peeled, you may even spot a cassowary wandering close to the centre. The drive through the Daintree is a scenic one, with plenty of smaller roads leading to interesting hiking trails and secluded beaches. The area is very photogenic, and there is some great wildlife spotting opportunities. Cape Tribulation is the northernmost point visitors can reach in the Daintree via sealed road. The remote headland is known worldwide for its pristine beaches and untouched rainforest. After exploring Cape Tribulation, you'll have plenty of time left to head back to Mossman. Get ready for a big drive the following day, as it is over 3 hours to Cooktown. Although you can't drive all the way to the tip of Cape York, as car rental companies restrict their vehicles being taken off sealed roads, you can drive to the largest city of the Cape. Although you can reach it in four hours on sealed road from Cairns, Cooktown feels has a remote feel to it. The Great Barrier Reef is close to the shore here, so you'll be able to get some great ocean views from the Grassy Hill Lookout. Visit the Captain Cook Museum to learn more about the area. Follow the same highway from Cooktown back to the Tablelands. You can break up your journey with an overnight stop in Mareeba. If you're interested in bird-watching, this is the perfect town for you. Nearly half of all bird species in Australia can be found in the surrounding Wetlands. The region is also famous for its coffee production. You can learn about the history of the industry in Mareeba at Coffee World. Nearby, you can enjoy a cup of coffee at Australia's oldest coffee plantation, Skybury. If you prefer wine, there are also a number of fantastic wineries in the area. Stay at the Jabiru Safari Lodge: You'll be able to do some wildlife watching from this lodge, which is located in a beautiful setting away from the town. Before you leave Mareeba, take a scenic balloon flight over the magnificent Atherton Tablelands. The best way to see the area is from above, where you will get a birds-eye view of the volcanic lakes, rolling hills and forests of the Tablelands. The balloons leave at dawn, so you'll be able to enjoy an unforgettable sunrise. One of the most popular villages to visit in the Tablelands is Kuranda. It has come to be known as the 'Village in the Rainforest', and there is a lot to fit into one day here. 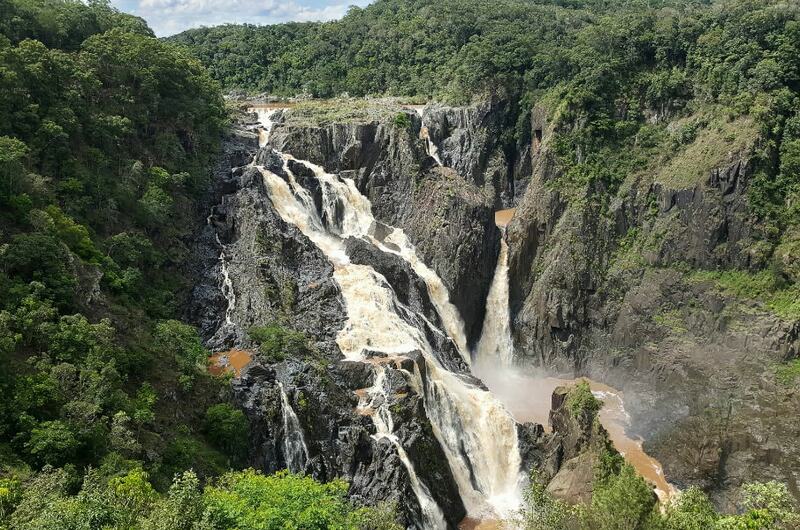 From the markets, to the fast-flowing Barron Falls to the numerous wildlife parks in the town, you'll have plenty to keep you entertained. Try the sweetest treats in the Tablelands: The Kuranda Candy Kitchen is a local favourite. Purchase some of the delicious homemade rock candy to take on the road with you. For your last day in Far North Queensland, visit the attraction that made the region famous around the world. The Great Barrier Reef is located just offshore, and there are a number of touring companies taking visitors out to the reef for the day. You can also choose to combine a trip to the reef with a visit to Green Island. Spend the day snorkeling over the reef, getting up close to the incredible marine wildlife. Some companies also offer glass bottom boat tours of the reef. The Great Barrier Reef is a highlight of any visit to Australia.